Eco Clean Carpet and Tile Care receives calls for the most extreme tile and grout cleaning of all time. Not all of the pictures will be the worst of the worst, but an overall great collection to browse through. 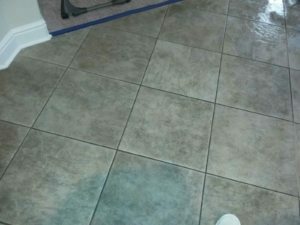 We hope this might help with realistic expectations, and for some customers that might be questioning if there tile and grout can be cleaned, or will it not turn out great at all? 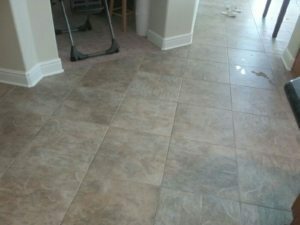 We will continue to post pictures of results from the tile and grout cleaning work we do. Now for the fun part, we will even show pictures of the not so good results. This doesn’t mean the work was done improperly, but it will give us a chance to show what types of damages we come across. We are completely confident to reveal staining that will not come out and we promise this is permanent. One of the biggest is worn damage or permanent staining. Yes, you can wear tile, it’s hard to do but it happens. We are going to show all of them, so if you’re see your floor here go ahead and chime in. Below is a floor with a red wine stain on it. The blueish color that is left behind did lighten up, Ultimately it was left behind and permanent. There is no Tile and grout cleaning that can take this color of the floor. 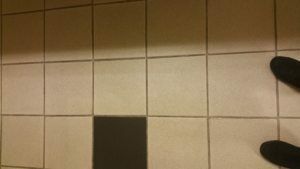 If this ever happens to you soak up the standing spill so that it has a harder time absorbing into the stone or grout lines. commercial tile with extreme grout staining. About 1000 people a day travel over this to the bathroom area. 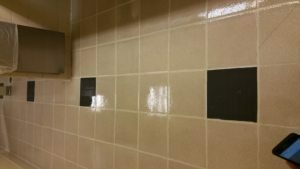 We used a color seal to correct the grout color and then applied a clear protective sealant. This floor was in one of the worst conditions we have ever some across, so to get these results we were absolutely impressed and hope you are too? you can see the dark grout lines and even a shadow if a light blue color from a spill stain. This is in progress, you can see the grout becoming lighter and the spill stain becoming smaller as they are working on it. Great job color sealing the heavily trafficked bathroom. I was wondering what kind of clear sealant you used on top of it? Was it something semi-permanent, like EPIC or Microguard Adsil?